DU admission form for UG courses is available from 15 May 2018. The candidates can apply for the programmes /courses of their interest through a single online registration form. The registration process for DU online admission will end on 7 June 2018. The major change or if we say the good thing about this year's registration is that the candidates can apply in both merit-based as well as entrance based courses through the same online portal. Only the admission for UG courses has started, the PG registration will start from 18 May 2018. Apart from merging the online application for merit as well as entrance based test, there are many more changes introduced in DU Admission this year which are given below on this page. The registration of women applicants from Delhi seeking admission in Non-Collegiate Women’s Education Board (NCWEB) for B.A./B.Com has also started. The candidates can apply using the same portal. Only the citizens of India can fill the online admission form of DU 2018. Only Mother's name mandatory to be filled in the application form. Aadhaar Details are not mandatory. 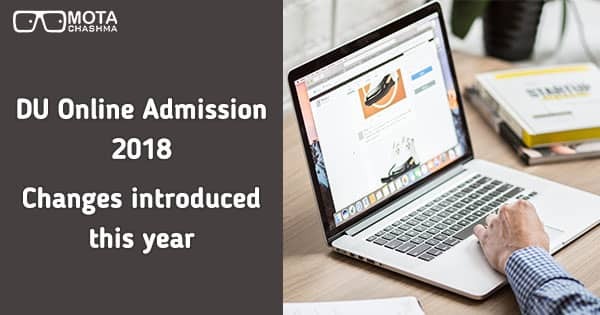 DU online admission process 2018 for UG has started from 15 May 2018. The candidates can fill the DU admission form online until 7 June 2018. There are many changes in this year admission process which are given below. The candidates before filling the application form are suggested to know them. Common Application for Merit & Entrance Based exam: The online application process for Merit, Entrance, Sports and ECA has started. There is a single application portal for all the categories. Last year the application form was different. The registration fee for the merit-based as well as the entrance based exam is different. The candidates are suggested to make the payment accordingly. Exam Dates for Entrance based courses have not been announced yet. Autofetch of Marks of CBSE Class 12: Details of the applicant's marks in Class 12 will automatically be fetched by the software from the database provided by CBSE when the candidates will enter their roll number and other details. Result awaited can make the payment - Last year, the students could not make the payment of the registration fee. However, from this year, the result awaited candidates can make the payment and they cannot edit the information after payment. While filling the sports section of the application form, the candidates can add three best certificates instead of one. The certificates will be uploaded separately. Forensic experts will check the documents of the students (Read News) so that no students are able to take admission based on the forged documents. The candidates who are opting for minority colleges (St. Stephens College, Jesus and Mary College, Sri Guru Tegh Bahadur Khalsa College, Sri Guru Gobind Singh Khalsa College of Commerce, Sri Guru Nanak Dev Khalsa College, and Mata Sundari College for Women) for the admission need to register on their college portal by using the DU admission form number and email id. The candidates have to pay fee at DU admission portal as well as at the Individual college portal. Delhi University Admission is being done completely in an online mode. The aspiring UG students can seek admissions for a total of 56,000 seats. DU Admissions for PG programmes will start from 18 May, while for doctoral level programmes from 20 May. Delhi University is a central university and one of the most renowned universities in India attracting students from various states.